The funeral service has been held for the mother and daughter who were found dead in a flat in Newry, County Down. The bodies of Giselle Marimon-Herrera and her 15-year-old daughter, Allison, were discovered on 7 March. Police said that Allison had been strangled and there was a "strong possibility" her mother had died in the same way. Family members travelled from Colombia for the service. Ms Marimon-Herrera's partner, Russell Steele, was also found dead in the flat. He died by hanging. Police began a murder inquiry, but said they were not seeking "anyone else" over the deaths. It is understood that Ms Marimon-Herrera's parents attended the funeral service at City of Belfast crematorium on Friday. SDLP councillor Michael Savage said he believed that members of the family arrived from Colombia at the weekend. He said that the funeral service represented "a very sad end to a very sad episode in Newry". Their deaths have caused shock and horror within the city's small but growing Spanish-speaking community. 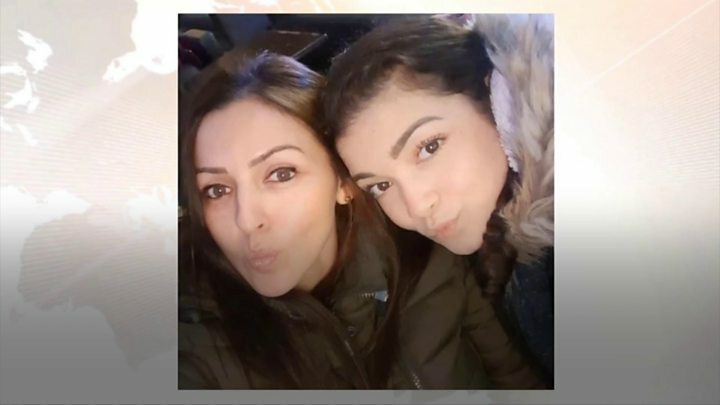 Giselle and Allison were regular customers at Maya Cafe, a South American restaurant in Monaghan Street, where they were both well known and liked by staff. "They were of a very quiet nature, genuinely nice," said cafe owner, Montse O'Bardain. She described Giselle as a "lovely lady" and said Allison was a "bright wee girl". "I suppose they were just new here... they were trying to find their space within the community," she said. "Allison was talking about being in school and trying to make more friends." Mrs O'Bardain is originally from South America and describes herself as half Guatemalan and half Mexican. Her cafe hosts languages classes and has become something of a multi-cultural meeting point for Newry's expanding migrant population. "A lot of people from different backgrounds, but especially Hispanic people, come here as a wee hub to get together, to speak Spanish to us and to find a little bit of home," she said. She added that Giselle and Allison visited for the same reasons and had been in the process of making new friends within the Hispanic community. When Mrs O'Bardain found out Giselle was Colombian she was "very excited" and said they were making plans to visit South America together. She said when her Hispanic friends found out about the deaths, they were "just horrified" and she described it as a "tragic situation". In a statement released through the PSNI, Ms Marimon-Herrera's family thanked the Newry community for their kindness. The principal of Newry High School Iestyn Brown described Allison, a "talented, kind, courteous and well-mannered pupil with a beautiful smile". Her said that she would be remembered with great affection by fellow pupils and staff.